A Ghost Story, starring Casey Affleck, reviewed. This odd movie, starring Casey Affleck under a bedsheet, won’t scare you, but it will haunt you. Yes, that is Casey Affleck in A Ghost Story. Walking out of David Lowery’s A Ghost Story, a fellow critic told me, “I feel like the best review of this would be just the words ‘go see it.’ ” I knew exactly what he meant. There’s a simplicity to this 87-minute wraith of a movie that seems to demand bare-bones description rather than lavish praise. The plot can be summarized in a sentence: After a man dies, his ghost returns to haunt his former home, waiting for some sign from his beloved. 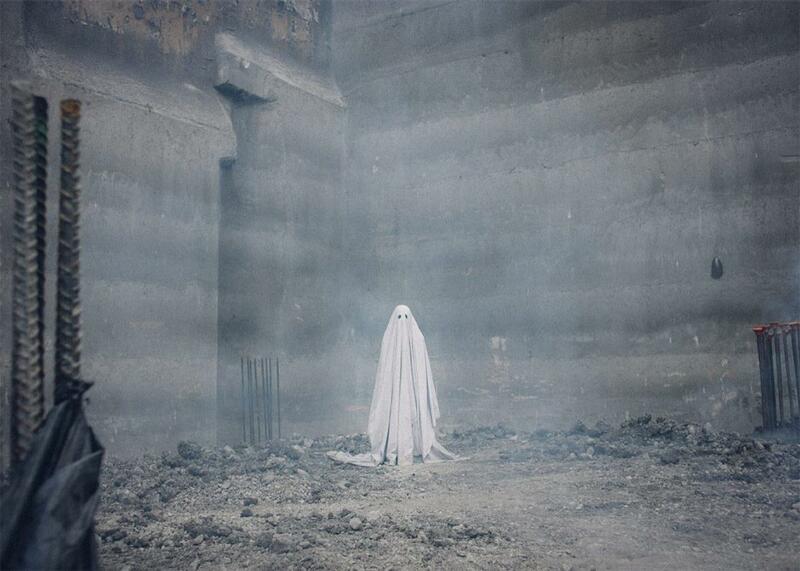 Yet in its brief sojourn on the screen, A Ghost Story moves through centuries of geologic time and into the deepest recesses of the human heart. A shot of a night sky full of stars appears once near the beginning and once near the end of A Ghost Story, as if to set off what comes between as a space for cosmic contemplation. This isn’t a horror movie; it’s a philosophical fairytale, and anyone expecting jump scares or steadily ratcheting suspense will leave disappointed. Except in a few rare moments, the ghost of the title—identified in the credits only as C and played, for the most part under a sheet, by Casey Affleck—doesn’t do much in the way of active haunting. He just sort of stands there—though what “there” comes to mean as time passes, and how his relationship to that space changes and deepens, becomes the whole subject of the film. Before C’s death—which happens early, around the 10-minute mark—he lives with the woman he loves, M (Rooney Mara), in a one-story ranch house that they’ve recently moved into. (The location is never explicitly identified, but Lowery, who lives in Dallas, shot his 2013 western Ain’t Them Bodies Saints—which also co-starred Affleck and Mara—on similarly scrubby Texas terrain.) We gather two important pieces of information about this couple from their spare introductory scenes together: They are deeply in love, and they have divergent feelings about their new residence. He’s happy with the creaky old place just as is, complete with the used piano that came with it. She’s been known to discreetly search the real-estate listings with an eye toward chic-er, more urban dwellings, and harbors doubts about keeping the perpetually out-of-tune piano. But shelter-related disputes notwithstanding, C and M seem like a loving young couple eager to build a life together—which makes it all the more shocking when C suddenly dies in a car crash, of which we glimpse only the eerily quiet aftermath. In the next, near-silent scene, M is at the morgue, numbly identifying her beloved’s body to an attendant before she covers it again with the white sheet and leaves. After the room is empty again, the camera remains on C’s sheeted figure for some time. Then, with a suddenness that’s less spooky than it is simply surprising, the man under the sheet sits upright, gets off the slab, and sets out for home, the sculptural folds of his now-permanent white garment billowing behind him. We need to talk for a moment about the design of the ghost’s costume, that iconographic sheet-with-two-eyeholes figure that can’t help but evoke at once a child’s drawing and the world’s lowest-end Halloween costume. (It should be said that Affleck’s sheet—given mysterious heft and form by costume designer Annell Brodeur—drifts behind its wearer with far more poetic suggestiveness than, say, Charlie Brown’s.) Lowery’s choice to render his spectral protagonist in this gently comic guise gains in meaning and richness as the movie goes on. No other visual representation of ghostliness—digitally making Affleck’s body look transparent, for example, or having him return as some gruesomely decayed version of his living self—could have accomplished what the classic sheet-ghost does. Somehow, the primal familiarity of that image allows the audience to extrapolate from this individual ghost’s story to the story of all ghosts, which is to say, potentially, to all of us who are currently alive. Whether or not you believe in an afterlife, the journey of C’s disembodied spirit will take you through some pit stops familiar from life right here on Earth: Grief. Jealousy. Rage. Resignation. Loneliness. Hoping for something for so long you begin to forget what it was you were hoping for. The last half-hour or so of A Ghost Story achieves something unusual in the annals of tales of the afterlife. Using almost no dialogue at all—only the achingly lyrical string score by Daniel Hart—the film’s conclusion upends the various metaphysical oppositions that make most ghost stories tick: the distinctions between the living and the dead, the past and the present, the realm of everyday life and the supernatural. This compact but ambitious movie sends the viewer home pondering galaxy-sized questions: What does it mean to be attached to a place? To a person? In the vast stretch of history, what does it mean to search for significance in our brief scrap of time on Earth? What do the living owe to the dead? A lot of Ghost Story reviews will no doubt end with unclever jokes about how seeing this film is a “haunting” experience. But that play on words, hackneyed though it may be, conveys a visceral truth. This movie has remained with me for more than a week now, not only its images (many of which are indelible) but also its ideas. I find myself puzzling out the temporal relationship between one stretch of the story and another, wondering about the “rules” of the afterlife that Lowery’s script establishes, and even thinking about the successive generations of people who have occupied my own beloved apartment building, which is well over a hundred years old. Did any former occupant love this place enough to hang around, watching us through the eyeholes of his or her bed linens as we live out our own short lives, witnessing our little moment of history within the great sweep of history itself? After seeing A Ghost Story, being the unwitting occupant of a haunted house no longer seems like such a scary fate. Whether you believe in the supernatural or not, there’s no real alternative to learning to live with your ghosts.